Do not miss these posts, as some are part of the series on perfection. Scroll down at your leisure. Today, I met several members of the Dublin Choral Foundation-the Lassus Scholars- at breakfast. This very talented group of singers have sung at the TLM in St. Kevin's for a long time. Today, they did the Palestrina, Missa Aeterna Christi Munera and the website is connected there. They are available for tours, even to the US, by the way. I must say it was a joy to meet up with humble choristers. Those in the business will know what I mean. The leader is a personal friend of Cardinal Burke, who has said a high Mass at St. Kevin's for the past two years and hopefully will come this summer again. I am so glad to be back at the TLM after such a long time. For the sake of the laity trying to understand the stages of perfection, may I point out that today in the TLM, the reading from Colossians of St. Paul is a description of the illuminative state. The beginning phrase describes the type of knowledge and wisdom and understanding which comes in the illuminative stage. The life of the virtues follows that. Such fruits as long-suffering and patience are indicators of the person in that stage. The metaphors of light here directly indicate to me that St. Paul was in the Illuminative Stage. Of course, he and other great saints would experience what God has called all of us to experience. There is a saying which goes something like this: "The more insignificant one is, the more easily it is to find a place." This used to be true before the Celtic Tiger made the inhabitants of the Green Isle besotted with money, or before the Protestant Work Ethic which has morphed into idolatry of the rich and famous. Now, those with practically nothing are despised, judged, deemed insane or slothful. I know from experience the judgement of men and women who do not want to face suffering. God had another way of judging. He sees the heart. Christ was rejected by his own, even as a baby. Imagine the shock of St. Joseph, trying to understand why his charges by God, Mary and Jesus, had to endure the cold of the stable and the shut doors of the very people, the Jews, to whom the Messiah had finally come. Imagine. That is meditation. This is real stuff, not movie shots. How many hotels or b and bs today would take a poor couple about to have a baby? One never knows when one is entertaining angels and all men are made in the image and likeness of God. But, people's hearts have shrunken to their own image and likeness. The above phrase has to do with travelling light, as we said in our generation. The nuns at Tyburn have a 48 hour notice as to whether they will go to Columbia, Ecuador, Scotland, New Zealand, Australia, England or Rome. 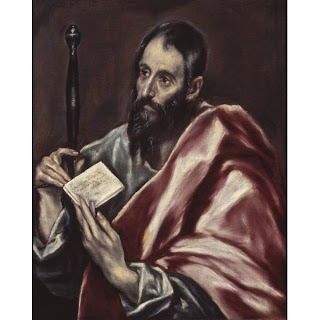 St. Paul had a skill in tent-making (yes, he worked as well as preached and wrote) which was a movable skill. I have three suitcases. One for summer, one for winter and one with books. I take one with me. I took one into the convent and left with one and a bag-of notes and diaries. Most Catholics are so tied down to their places of living and employment that there is no room for travelling light. That may be good, as it is their vocation. But, for some, simplicity is a necessity. And, it is very hard. However, as I have learned, there is no suffering without a quiet joy and that joy is being one with Christ as He joins Himself with my suffering. Hard is good, but the hard must be determined by God. We do not choose our suffering, God does. That is why it is important to discern a vocation. Joseph and Mary, if we meditate, would have been planning their trip to Bethlehem at this time. Joseph would be temporarily closing down his shop in order to travel and be ready for the birth of Christ. Mary would have been planning what minimum things she could bring. Like me going on the plane, she did not have money for extra bags. One would suffice. Both had to trust in God the Father and the Holy Spirit who was leading them. Mary had the advantage of being in constant communication with the Indwelling of the Trinity-the first person to whom the Trinity was revealed. Father, Son and Holy Ghost would accompany them to Bethlehem, despite cold, derision, rudeness, and rejection. The Church does not know much about Joseph but he was a man of great faith. Scripture and Tradition give us no knowledge of his heart, mind, soul, except that he was obedient and humble. There are some private revelations, but I do not use those for teaching. The stable was not a nice place. Animals are not clean. Cute, maybe, but not clean. I grew up in Iowa. One of my uncles had a farm. Cows do not smell nice. Neither do sheep, or dogs, or chickens, or geese. Only cats are clean. At the end of my pregnancy, I would not have wanted to be near a cow. Bethlehem rejected the Christ and the Queen of Heaven and Earth and her Guardian. Do not reject Christ, Mary or Joseph. Do not pretend they were middle-class and looked well-heeled. Meditate and the Holy Spirit will show you many things upon which to ponder. 5:45 so that you may be children of your Father in heaven; for he makes his sun rise on the evil and on the good, and sends rain on the righteous and on the unrighteous. 5:46 For if you love those who love you, what reward do you have? Do not even the than others? Do not even the Gentiles do the same? "The one who bears God finds no room." Here is a great quotation from St. Gregory, which is in my heart, "No sacrifice is more acceptable to God than is zeal for souls." Perfect love involves giving, teaching, reaching out to others. "St. Thomas writes that the love of our neighbour for the sake of God is more perfect than is the love of God alone," writes Humphrey using Suarez. He adds that the love of others includes the love of God Himself. The love of God for the service of others is as the Jesuit says, "a sign of greater love for a man to serve others also for his friend's sake than for him to be willing to serve his friend alone." Wow, this truism has been lost among Catholics. We can only love others if we love God first. We can only love others if it is for the sake of Christ Himself and not our own, or even the sake of the other. So, if one is married, one loves one's spouse for the sake of Christ. The stage of prayer which St. Bernard speaks of includes intercessory prayer. This is a work of mercy and involves loving others in Christ enough to pray for them, even do penance for them. Catholics are starving for the Truth, for the real Catholic teaching. Unless I and others feed the lambs, people will go to hell. I could go to hell for not feeding, sharing my two fish or five loaves, and prayer opens me up so that I can do this. The third step is prayer; and the fourth step in the stair is contemplation. St. Bernard stated that the third step towards contemplation is prayer. At this point, the person should really beg God for the graces, all the graces of purification and humility. Such gifts as indifference and a heightened sense of sin occur at this time. One sees the horror of the smallest sin, making repentance easier and faster, in a way. Prayer at this stage is begging for the completion of the purity of heart necessary to see God. St. Bernard makes an interesting comment that seeing a holy man may cause one to greater compunction, as one sees one's own sin more clearly in the face of holiness. How nice it would be if we saw this type of holiness daily, or even on a regular basis. Alas, such is rare. Prayer becomes more and more silent at this stage as well, but still, as all the great saints tell us, we sin and need to ask God for help in changing our hearts. I ask God for His Heart instead of mine. He waits at the door and knocks. 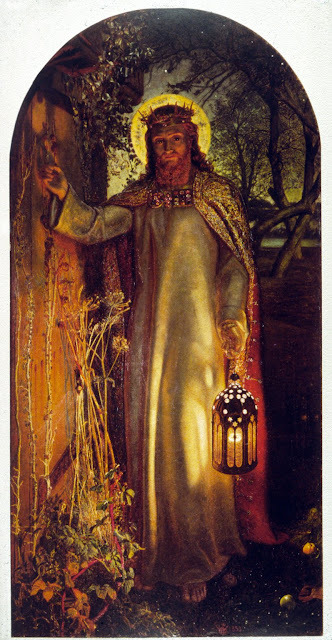 We have the free will to let Christ in...or, to be more exact, to realize He is with us constantly. That is the goal of prayer-repentance and the intense awareness of the Presence of God. The imperfections of our mind, heart, and soul need to be destroyed, and our being needs to be purified to accept the fullness of the Indwelling of the Holy Trinity, which we receive at baptism. Here is the blog site of a talented young lady who makes lovely, modest wedding dresses. She is busy until after Christmas, of course.